After a hearty response of over 250 applications and a rigorous, difficult selection of 25 startups for the finale, we are proud to announce the winners of our annual B-Plan competition, Smartup 2017. The finale was a 2 day event was held from 13th-14th October at Kirori Mal College in North Campus, Delhi University. SmartUp is an initiative to help budding entrepreneurs validate their ideas, provide one-on-one mentorship from internationally recognized experts and gain access to a wide network of investors. The 25 shortlisted startups were given three minutes each to pitch their plans on the first day, followed by a two minute Q&A with the jury. After the first round of pitching, a one-to-one mentoring session between the mentors and the startups was held where the startups learnt how to improve their pitches. The second day began with 90 second elevator pitches by all the selected startups. This was followed by an interactive talk session by Amit Singh, Managing Director of Headstart Network. The esteemed jury included Arpit Agrawal, (Principal, Blume Ventures, Co-founder and Director, Headstart Network Foundation), Ashish Taneja (Managing Director, Growx Ventures), Paresh Gupta (Founder, Global Centre for Entrepreneurship and Commerce), Amit Singh (Founder & CEO, Wow Labz Co-Founder and MD, Headstart Network Foundation ) and Vibhuti Channa(Director Espark- Viridian Accelerator). 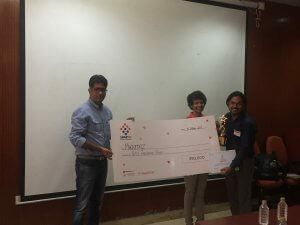 Marketyard Agrisolutions, a Pune based mobile application that enables users to buy, sell, and rent everything related to agriculture emerged as the winning startup and was awarded a cash prize of INR 1 Lakh. 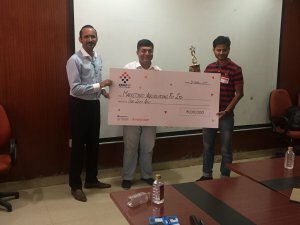 Bengaluru based technology startup Machstats, which provides end to end solutions in industrial IOT bagged the first runner-up position with a cash prize of INR 50K and healthtech startup ClinMD which helps digitize medical records using just a piece of paper emerged as second runner-up with a prize of INR 25K. We believe such events provide the required impetus for young entrepreneurs of the country to be inspired, see their business plan and ideas from an outside perspective and get valuable information about the current ecosystem scenario and investor mentality.